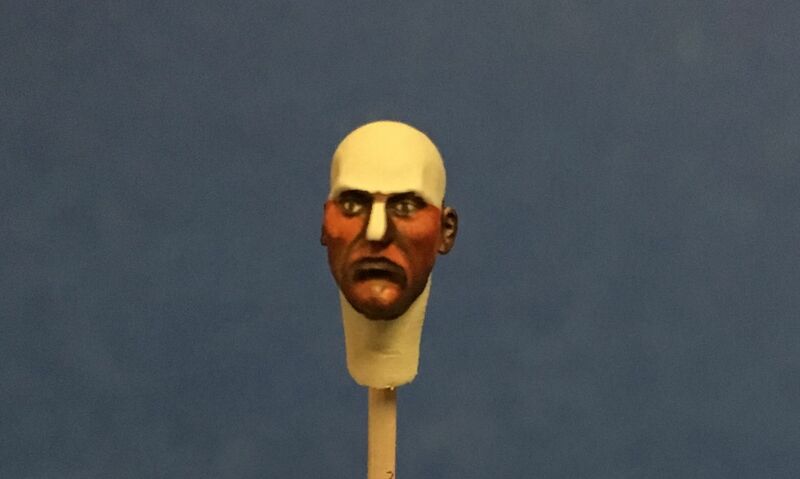 I wanted to do a SBS on painting faces in small scale figures using water based paint. The paint that I prefer is called Reaper, it is made right here in Texas just 30 minutes from my home. 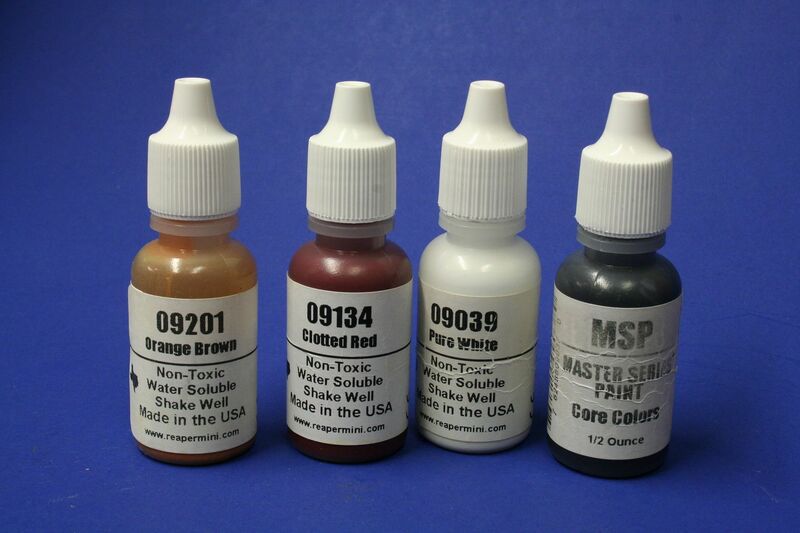 It is a smooth and very fine pigment paint and is a little wetter than most water based paint so it gives you longer to blend. Now with that said I need to also say that longer drying times is relative and all water based paints dry fast but Reaper gives you a little bit more to work with. 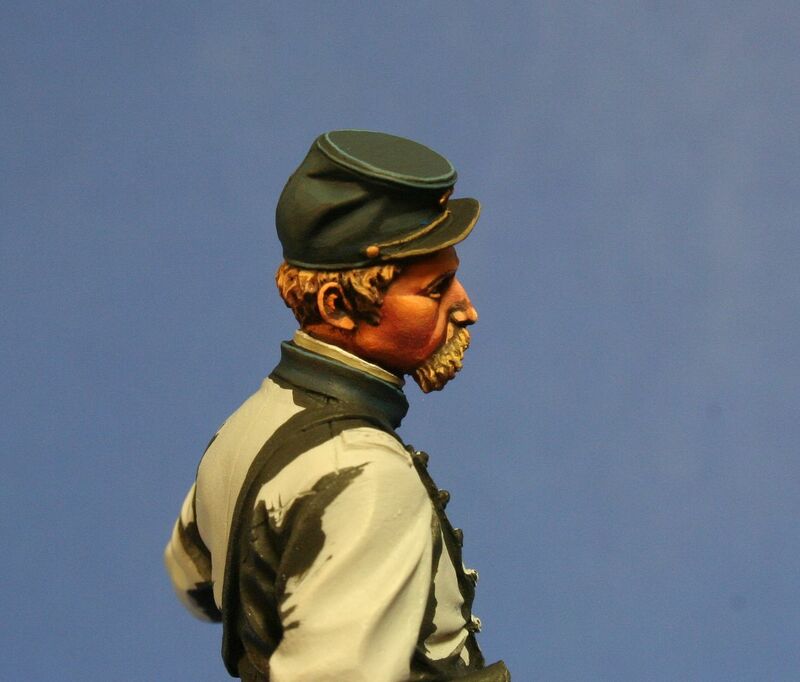 To paint a face I use 4 colors (white faces) here they are. pure black, pure white, orange brown, and clotted red. 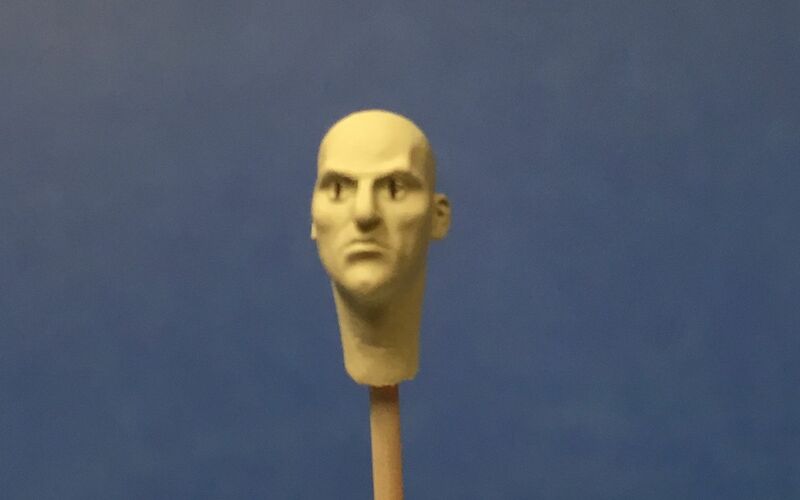 I start with a good face sculpt, this is a 54mm Hornet head. 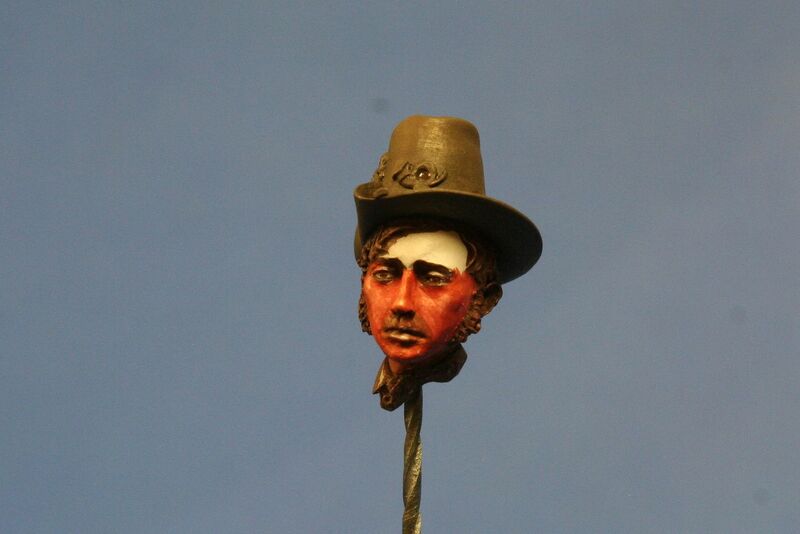 Hornet heads come with a lot of different hats and helmets and lots of cool faces and expressions. 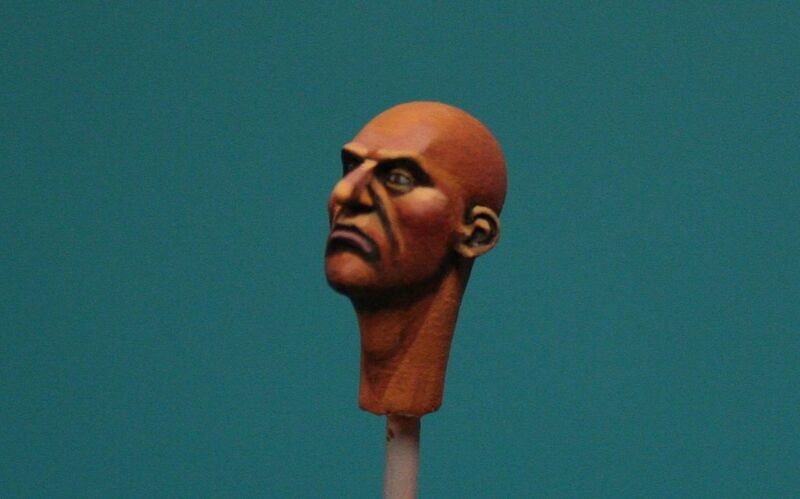 Its hard to paint a bad face into a good face and so I would recommend using a good sculpt to start. eyes are so important, so take some time and get them in the same place on both sides, either just in the middle or both right or both left, I make a line across the eye wight he color I want the eye to be. 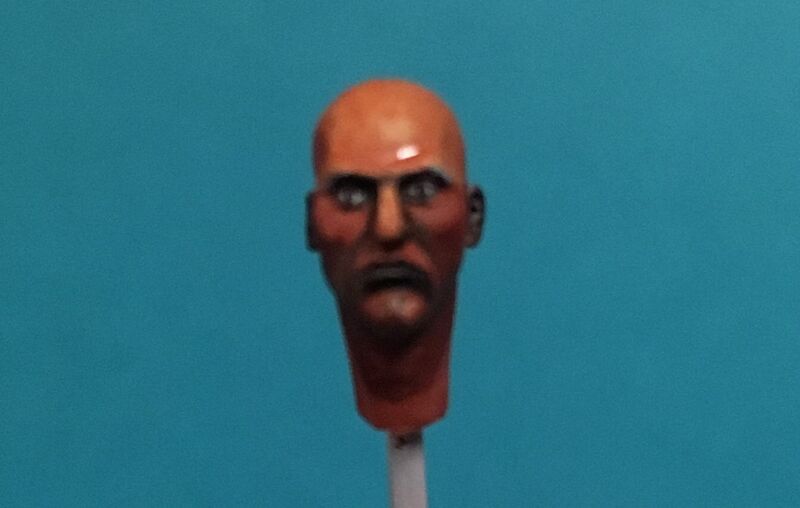 next I paint the lower part of the face with a dark brown color made from clotted red, black , and a little orange brown. I know this looks really dark but it is a good base for the colors that follow. 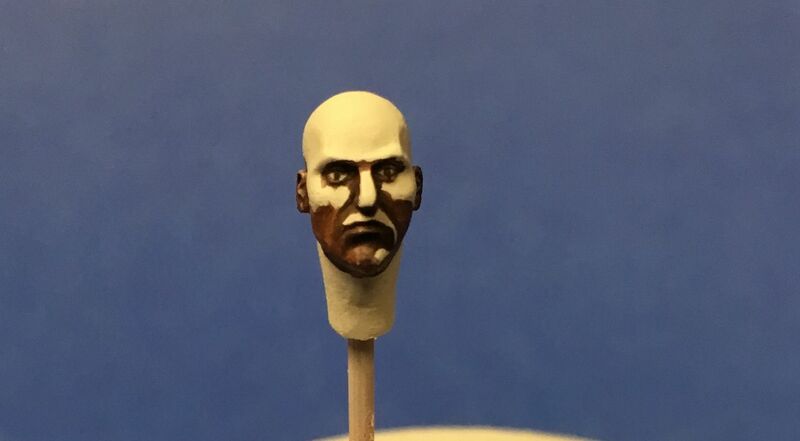 the next step is to use orange brown and clotted red and just a touch of black and fill in the middle part of the face with a dark base. 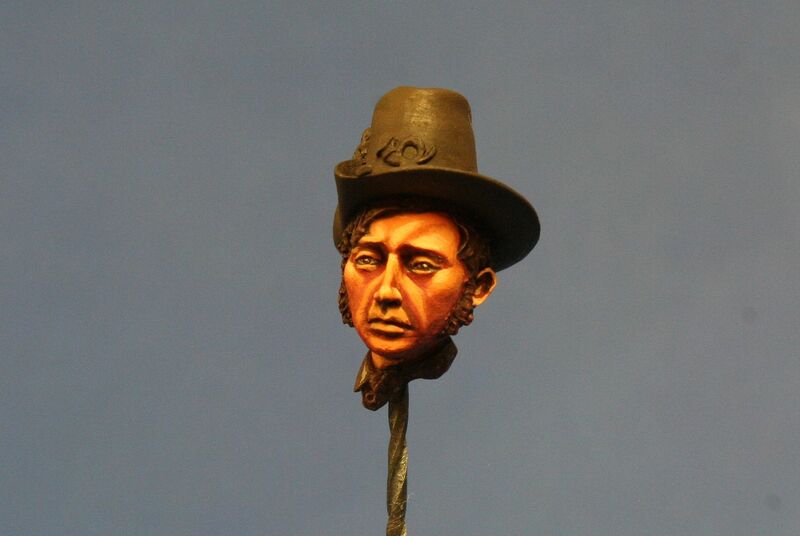 the neck gets the same treatment to give a dark base for the colors that come next. this picture is out of focus but shows the tones well. Shaping up to be one of the better tutorials I have seen so am following this eagerly. Your color blending looks so smooth. How do you accomplish that? Thanks Doug for the SBS tutorial ! 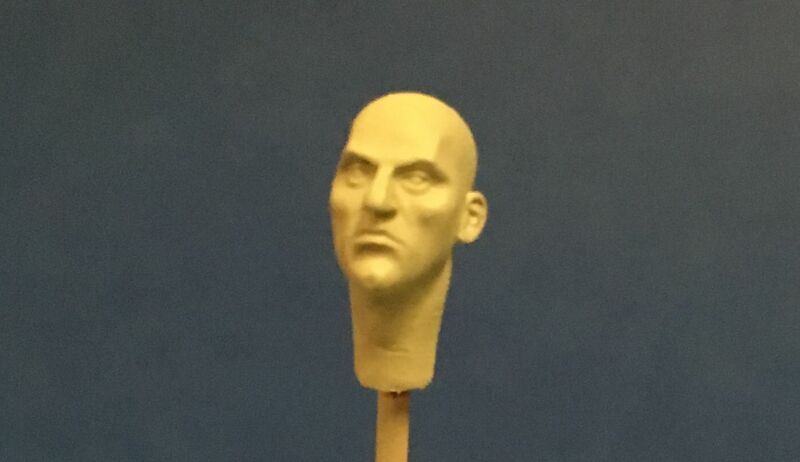 Question #1 : Has the head been primed ? 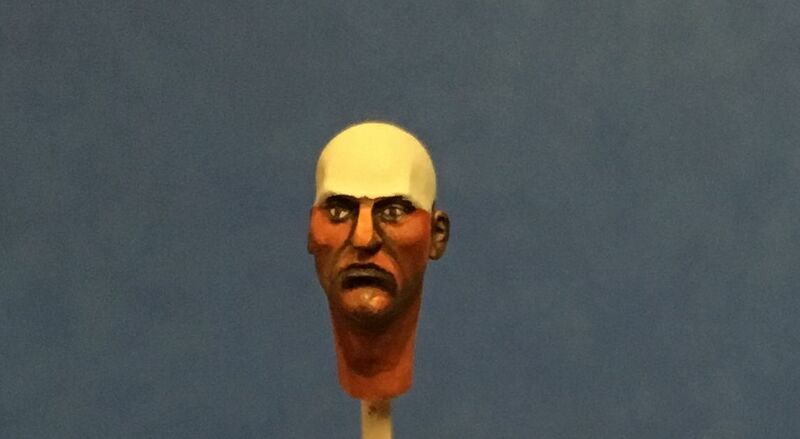 Q #2: Do you paint a head in one session ? I really enjoy your tutorials! Thanks for your efforts on this and past figures ! yes I use a light grey primer not white because I feel that grey gives a better color value to the colors that go onto it. white tends to make the colors too brilliant. 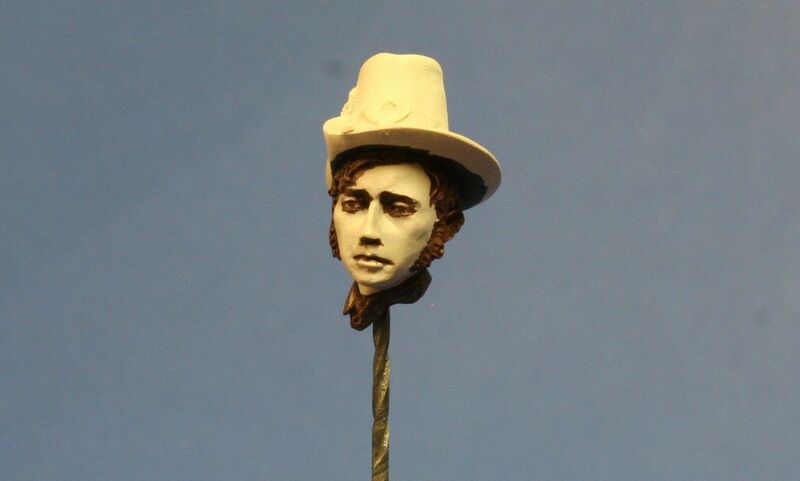 yes I paint a small head in one sitting usually because the paint blends better when it is not fully dried. 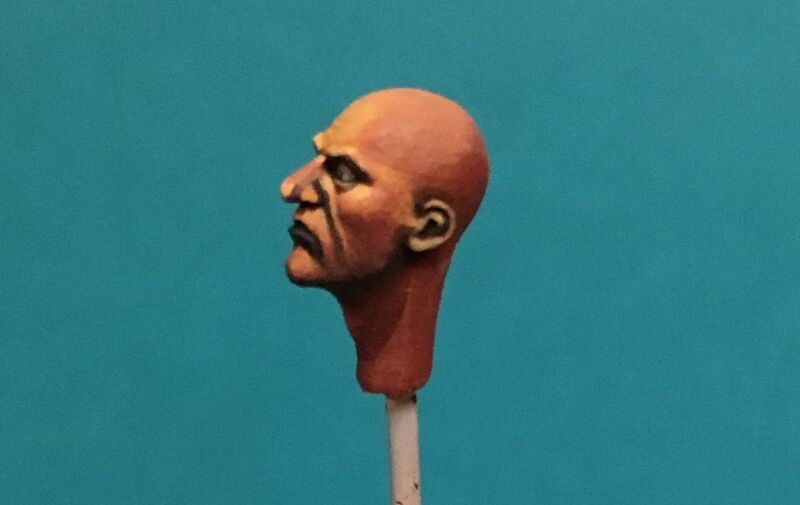 the next step is to begin the highlights by mixing more orange brown into the clotted red and bringing the highs higher and finer in the points of the face that catch the light like the top of the cheeks and the nose and brow area. again this picture is out of focus but show the difference between the highlighted areas on the right and non highlighted areas on the left. 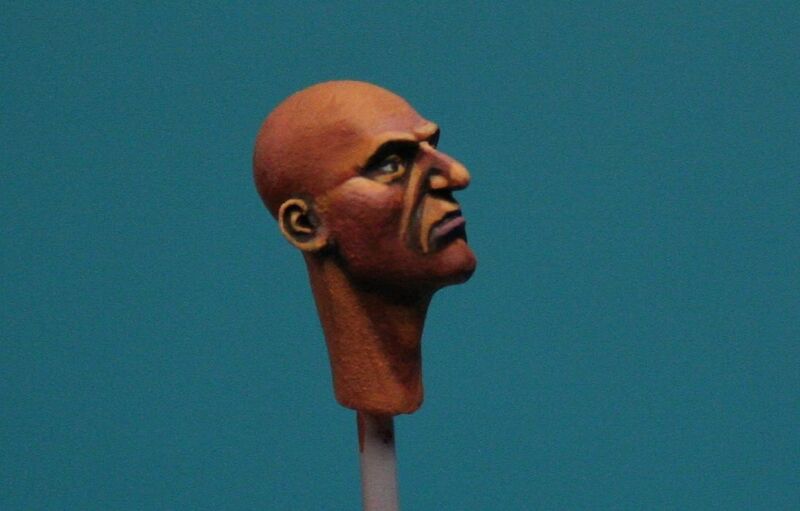 now that the medium highlights are in place the mixture now is orange brown with pure white and just a hint of clotted red for the even brighter areas followed by just orange brown and white for the highest areas like the tip of the nose the top of the cheeks and the brow, note also a line of highlight along the side of the nose and down along the jowl of the cheek. final highlights are in almost all white with just a hint of orange brown, note the tops of the ears, the tip of the nose, and toppity top of the cheek. also the lips are given a highlight of clotted red and white in a pinkish hue. now before you go and start painting I need to say that there is a lot in-between the pictures that is hard to take a shot of. As I place a highlight on the top of the cheek for instance i use a very wet mix of the prior color to scrub the area in-between the two layers, this blends the two layers together. There is a lot to be said for practice and experience so don't expect perfection in the first attempt, I have painted hundreds of figures and mine don't come out great every time. 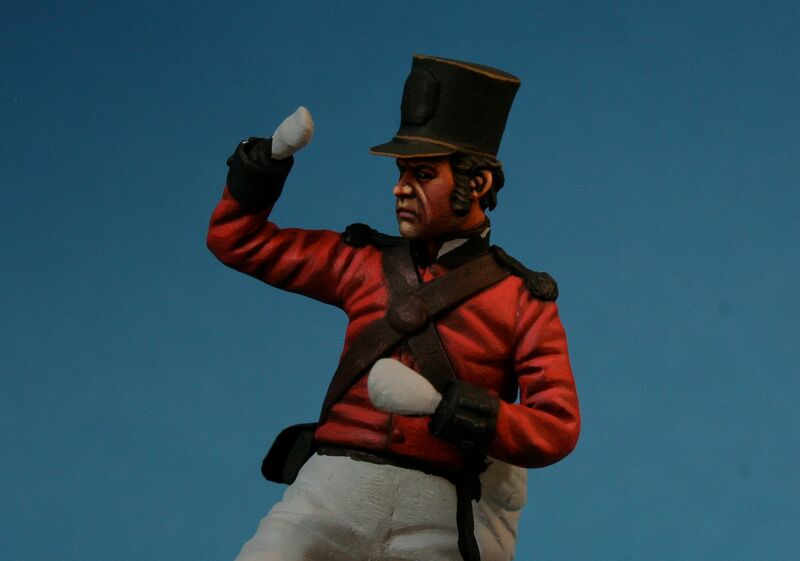 Also good brushes are a must, Windsor Newton Series 7 are the perfect choice for small scale figures like these. the same principles apply to other colors I think that the darker the shadows and the brighter the highlights the more depth the figure has and they look more three dimensional. red is a color that a lot of painters don't like to try but if you will keep the shadows dark and the highlights not too pink but bright red it will look good. 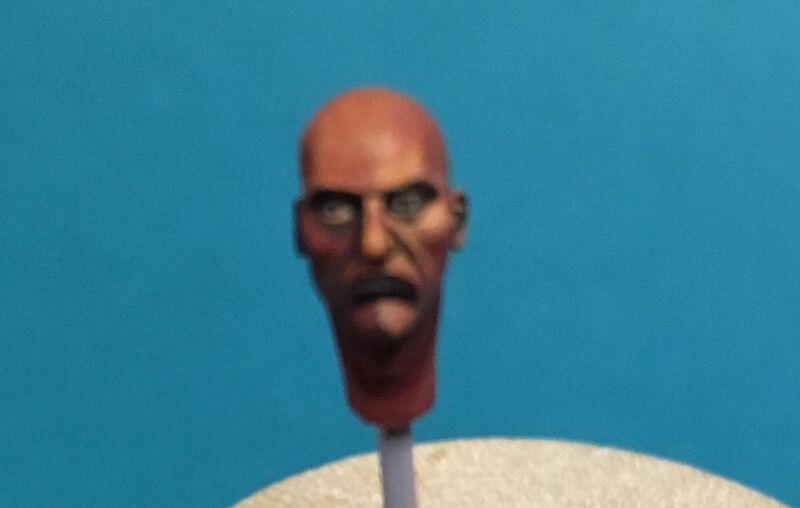 here are another three shots of a face being painted, perhaps the transitions will be easier to see in these images. this face is a 75mm figure or 1/24th scale. 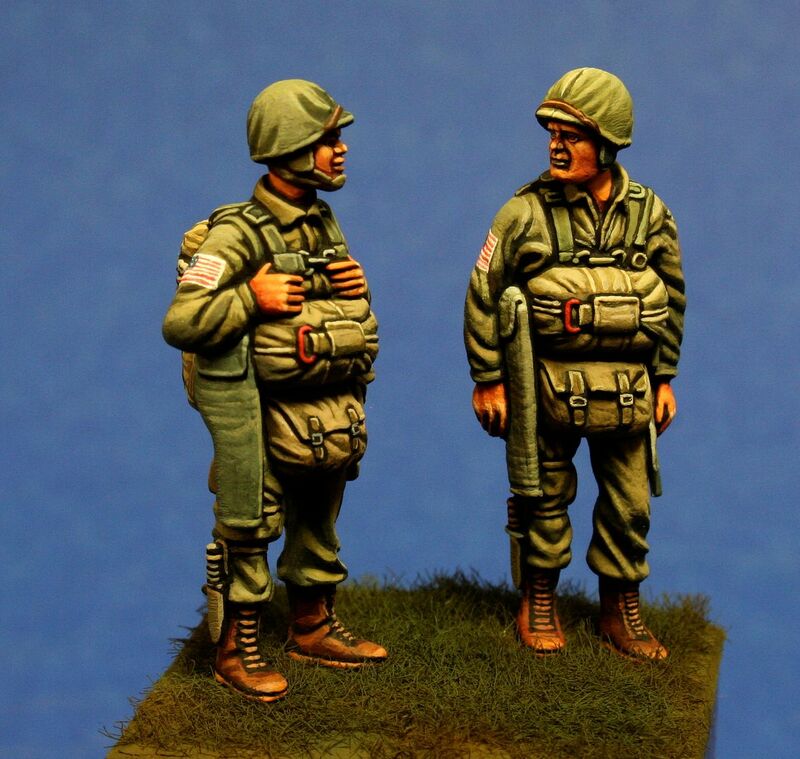 these are two figures from the Monogram C 47 in 1/48th scale, the same high and low values are painted on them in this smaller scale but of course the detail is just hinted at in some cases. 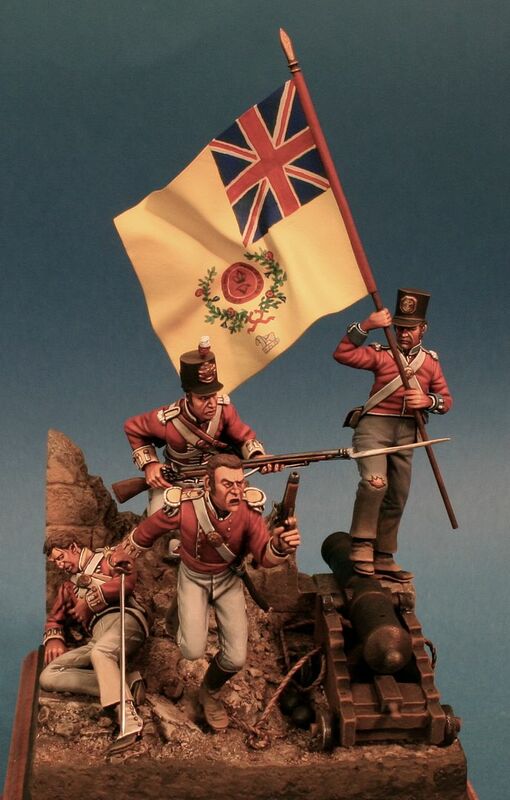 this is the charge at Badajoz in Spain and is the piece the red coat guy goes with. even in the ground and flag the bright highlights and dark shadows are evident and it was all done dark to light. Very nice tutorial Doug. 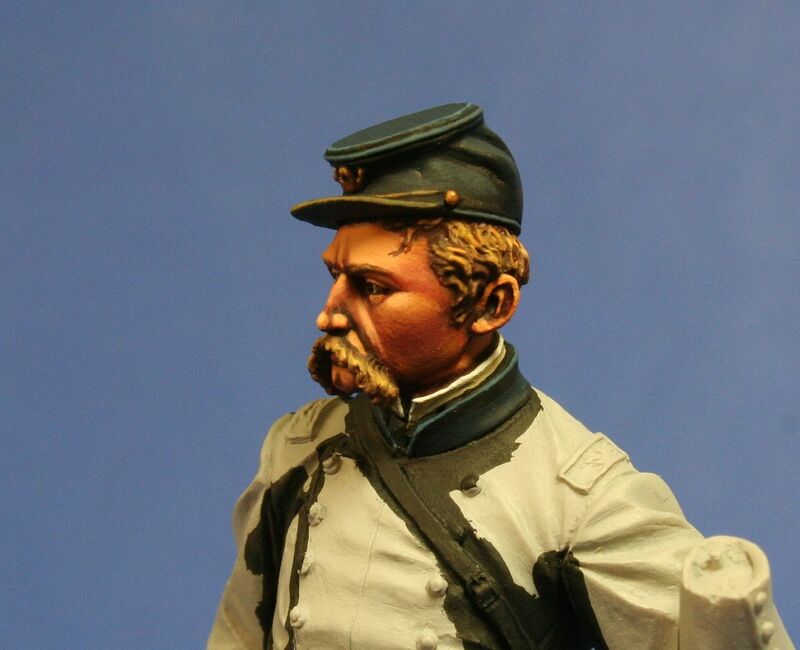 This is really old school stuff, but sometimes the "old school" is best, especially when dealing with 54mm figures and smaller. 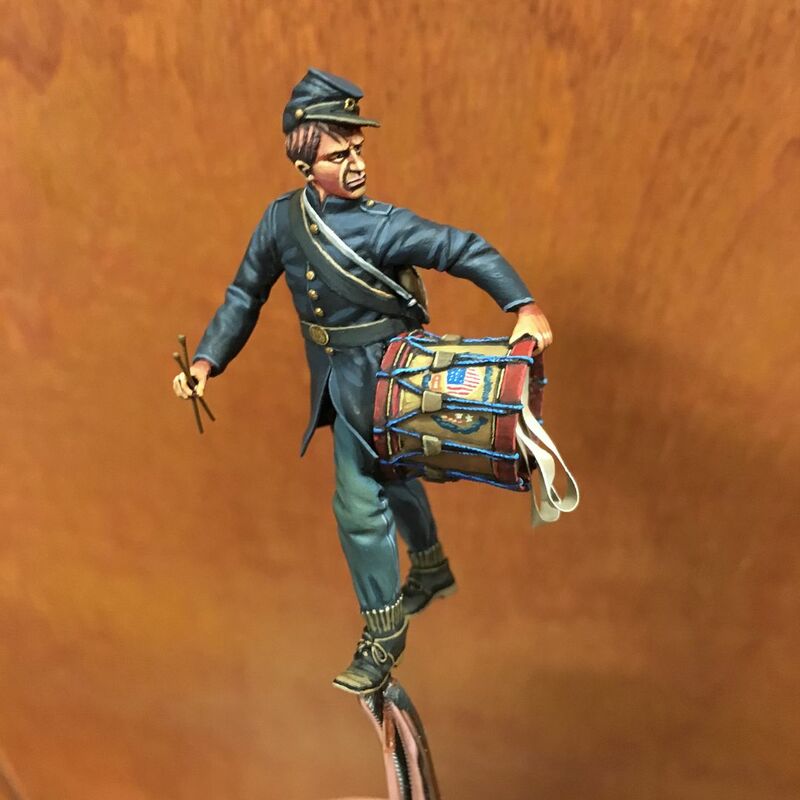 I've been painting so long with the newer "Spanish" "translucent" method, in 120mm scale, that I'd quite literally forgotten how to do this-- thanks Doug for jogging my memory! Your work is fabulous.